Successfully Added Portable GPS and Cell Phone Jammer (GSM, DCS, GPS) to your Shopping Cart. Cell phone and GPS jamming is made more portable and affordable than ever with our new Portable Cell Phone and GPS Jammer (GSM, DCS, GPS). If you are sick of all those phones going off or being tracked everywhere with GPS, then this is the ideal anti-spy gadget you have been looking for. 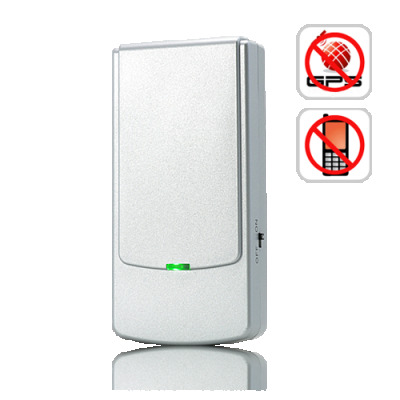 Anti-Phone: Transmitting low power radio signals to cut off communications between cell towers and any cell phones in the proximity, this Cell Phone Jammer completely shuts down any GSM and DCS mobile phone signals within a 10 meter radius. Anti-GPS: Worried someone has intentionally installed a GPS tracker somewhere in (or under) your car to track all your movements? It's more likely than you think, but now worry no more because this jammer offers a perfect 10 meter radius of GPS jamming, ensuring your privacy no matter where you go or how large your vehicle is. Ultimate Convenience With the small and portable size, you can keep this device in your pocket, inside your bag, hidden under the seat of your car, anywhere! Also, with just an on/off button and green light to indicate the device is working, this Portable Cell Phone and GPS Jammer is simplicity at its best. You also don't have to deal with antennas to install or setting up any software/configuration, because this jammer is ready straight out of the box for instant jamming and unjamming. Well-priced and well-built, this Portable GPS and Cell Phone Jammer offers powerful jamming for only a fraction of the price and size of famous, brand name jammers. Get yours now at an excellent factory-direct wholesale price, brought to you by the online leader in GPS Trackers and Jammers - Chinavasion. Up to 10 meter knockout radius! Does this mobile phone/gps jammer pose any health risk issues? No, this mobile phone jammer is completely safe to use. Will this jammer affect other electronic devices? No, nothing aside from GPS devices and cell phones will be affected by this jammer. Haven't tried the product yet bet the delivery is faster that any delivery I have had in the United States, product is being charged and I have faith in China Vasion that there product will work as advertised. As i was speaking I went to the product and turned it on and my phone signal level went from five bars to zero bars in about eight seconds very happy and satisfied. Now I know I will be ordering from your store again very soon. Thank you for outstanding service!